Jordan Flores has joined Chesterfield on a season-long loan from Wigan Athletic. 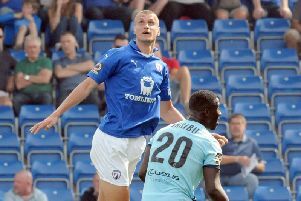 The versatile 21-year-old has teamed up with the Spireites ahead of Saturday’s visit of Port Vale to the Proact. Flores said: “I’m looking forward to getting some games under my belt and hopefully having a successful season. Flores spent the second half of last season on loan at Blackpool as they pushed for promotion from League Two. He made 21 appearances for the Seasiders, including a substitute appearance at Wembley in the play-off final. Blackpool beat Exeter 2-1 in May at Wembley to secure their place in League One before returning to Wigan. His only appearance this season has come against Blackpool in the Latics’ 2-1 EFL Cup win on August 8. And he knows the current Chesterfield boss well after Gary Caldwell gave Flores his debut when they were both at Wigan.